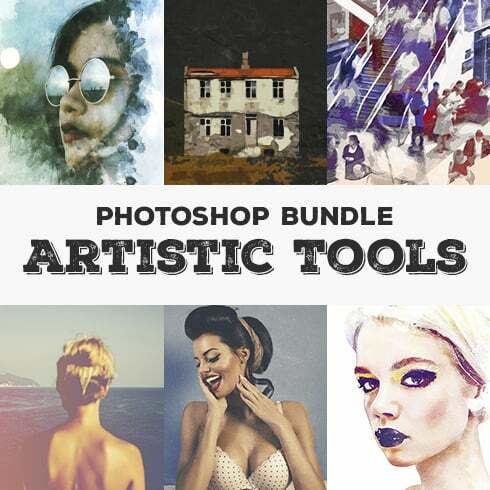 In this bundle, you will find a great number of photoshop supplies such: gradients, textures, painting effects, vintage effects, brushes, templates and text effects. These goodies will help you to speed up your work and process your photos/artworks in few clicks! Easy to use, edit and to make experiments. Well-layered and intuitively clear structure of psd. file. The “Faded Presets” is a special Photoshop effects set that include 20 gradient maps and 10 grunge textures. 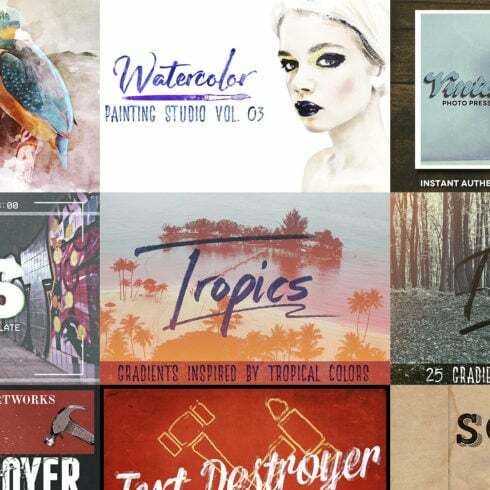 41 realistic watercolor brushes useful both for masking and texturing. Resolution of brushes is from 800 to 3000 px; 300 dpi. Can a designer draw any image from scratch? Mostly, yes. Should he or she? But for the most purposes, it may well require too much effort and won’t bring adequate revenue for him. This is exactly why the vast majority of web designers work with pre-made visual elements – blend these graphic components, modify them and construct the design . It is pointless to buy those parts one at a time, so that’s exactly why they are put into graphic deals and offered as a singular solution. There’s a way to make the MasterBundles.com bundles even cheaper. Just share this web page via social websites – you automatically receive the 5% price reduction for the graphic packages you prefer. That is a quite simple way to get an expertly developed tools for a lower price. For a single design project, you will need a bunch of elements – a few illustrations or photos, a font, just a few icons, and so forth. In case you would want to buy every one of them separately it can cost you a lot of money! So, that’s why experienced web designers look for graphic bundles to buy. The assortments of components accumulated into a graphics package are usually categorized based on their type and/or main objective. There might be packages with infographics, business card templates, wedding invitation templates, icons and mockups, etc. In addition, you may also be able to find graphic packages designed for Halloween, Christmas, Halloween or Christmas. Any other bundle deals on MasterBundles.com? MasterBundles.com offers you a large variety of different items. We offer not only graphics packages but also approximately 20 other various kinds of products. Fonts, WordPress themes, mockups, icons, photos, illustrations, presentation templates and a whole lot more – on the MasterBundles it’s possible to locate all of the products, vital for a design. What is an infographics bundle? Posts on websites that come with infographics are much more readable and popular than those that do not. A package for infographics works best given it gives an almost ready-made option. The web designer just has to blend the illustrations and there you are! Living in the digital and online era, many of us commit practically half our lives within social media platforms like Instagram. It doesn’t matter what purpose we attempt to reach by using this network, we need to stick out in a crowd amidst thousands of alike accounts. With high quality Instagram templates offered by MasterBundles.com, you don’t need to spend eternity building the outstanding appearance of your page. The designers who choose to utilize photos will be especially excited about the photo overlays graphic offers. These packages incorporate sets of elements of design that can enhance and alter the photographs. This type of components is normally placed over the photos to create some fresh and interesting look. 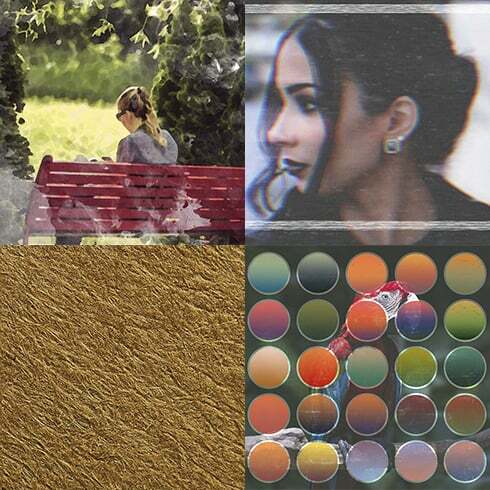 MasterBundles carries a big set of packages, full of photo overlay components. The watercolor graphics bundle can be described as a bundle which contains pictures and drawings made with watercolors. They’ll properly come in handy for a wide range of companies, including cosmetics, fashion, perfume and food distributors. Wedding invitations or cards is also made using this package. If you feel like you have lost track of time while searching for various resources and components for your current graphic design tasks, it is high time to learn more about MasterBundles.com. It is a website offering the most popular instruments (graphics, icons, logos, presentations, fonts etc.) for web designers, marketers, and developers at a reasonable price for a limited time. What’s more, you may use coupons and promo codes for particular design deals. In order to not miss significant information regarding the upcoming promotions, we recommend reading our blog and subscribing to the newsletter.